The seventeenth edition of the magazine «Mongolica» is dedicated to 110th anniversary of Mongolian scholar, public figure, translator and essayist Mergen-gun Gombodzhab (1906—1940). The article is devoted to the analysis of legal relations governed by law between Monglian and Kazakh peoples on base of their steppe legislation — monuments of law: Kazakhish “Jety-Jargy”, Mongolian “Ikh Tsaaz” and “Tsaadzhin Bichig” during rule of Qing dynasty in China when it’s army tried to conquer Mongolian peoples. In this article the main emphasis is on analysis of those concepts which modelled the limits of the all-Mongolian identity in texts of the XVII century. The analysis of the Mongolian texts showed that the all-Mongolian polity restored by Dayan-hagan kept the relevance in the XVII century, being designated both as the great Mongolian ulus, and as the great ulus of six tumen, positioning identity of all Mongolia. The article presents an overview of the goals, tasks, main activities and outcomes of the Mongolian embassy to Russia in 1912—1913 under the guidance of Ambassador extraordinary, minister of foreign affairs of Khalkha Khan Erdeni Daichin Qing-Van Khando Dorchzhi. 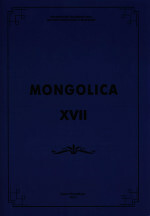 The characteristic based on archival and printed sources defines the staying of Mongolian deputation in Russia, examines the tasks of economic and political nature, which the delegation hoped to solve in Russia, analyzed financial expenditures of the Russian Imperial court and gastronomic tastes of the Mongolian deputation members. A special attention is given to an audience with the emperor Nicholas II, description and significance of Bogd Gegens gifts to the Imperial family. The article emphasizes the importance of the embassy in development of Russian and Mongolian political, economical and cultural contacts. A brief analysis of foreign policy goals of both countries against its neighbor is given. In this article the author regards the issues of imagery formation in modern Mongolian literature. One of the first works to present the image of the common person — a cattleman was Ts. Damdinsurung’s story “The Rejected Girl”, written in 1929. In the initial period of its development modern Mongolian literature largely relied on the form, genre and imagery of the folklore and medieval type literature. Story “The Rejected Girl” is not only the first fiction story, but also marks a significant milestone in the development of Mongolian literature of modern times. This paper introduces two incomplete Kalmykian manuscripts from the early XVIII century kept at the Saratov Regional Museum of Local Lore that contain some parts from the Tibetan collected book of auspicious and invocative texts known as “Mdo mangs”. They represent an unknown version of this book produced in Kumbum (Sku ’bum) Monastery which, in its turn, must have been connected with the earlier edition made in Shalu (Zhwa lu) Monastery, the latter one being analyzed in the groundbreaking paper by R. Meisezahl (1968). A special attention is paid to the structure of the Kalmykian version of “Mdo mangs” as reconstructed from the extant parts and some specific features of both manuscript copies. Some details on how these manuscripts appeared in the museum are provided, too. The number of Oirat woodcuts is small. And it is a great luck for researcher to find new ones in private collections. The article describes the Oirat woodcut dedicated to the cult of a Buddha Amitayus, the author discovered in China during a scientific expedition in 2013. Tsuur is one of the symbols of ethnic sound “Uriangkhai” living in Western Mongolia. The study used records expeditionary poster produced in Western Mongolia in 2012—2014 period, and the publication of materials. The aim of the article is to present the results of grouping tunes carried out on key characters, figures. The author distinguishes tunes on the theme of nature, animals, birds, characters from the world of men. Special angle study is associated with the ability to identify the most popular tunes and identify rare, unique. The article deals with particular cases for preference of comma usage, as provided by the punctuation rules of the Mongolian language as well as the practice of creating texts in the language. Rational for the function of the punctuation mark in the syntactic structure of the sentence, its syntactic nature and polyfunctions of the comma are considered in the material (in the texts) of Mongolian literature, in comparison with the translation of sentences into the Russian language. The latter has revealed peculiarities of how the punctuation mark functions and syntactic specifics of sentences presented by dissimilar (heterogeneous) languages. In particular, the role of comma in punctuation design of compound sentences is considered. Following leading linguists who have studied the problems of Mongolian Buryat and Altaic languages, the author has drawn her attention to the concepts of monosubjective, polypredicative, monosubjective-polypredicative constructions. The study has revealed syntactic feature of the both compound and complex sentences in the syntax of the Mongolian language, given in comparative background in the Russian language, and range of functions of the comma presented in these sentences. The article gives an overview of the genre marker ‘mGur ’bum’ in medieval Tibeto-Mongolian hagiography. The author comes to the conclusion that despite the popularity texts marked as ‘mGur ’bum’ were extremely limited in Tibet. As a result of the absence of the tradition of performing gur songs in Mongolia, Milarepa’s mGur ’bum remained the only hagiographical text of this genre and did not call into being the original Mongolian texts.